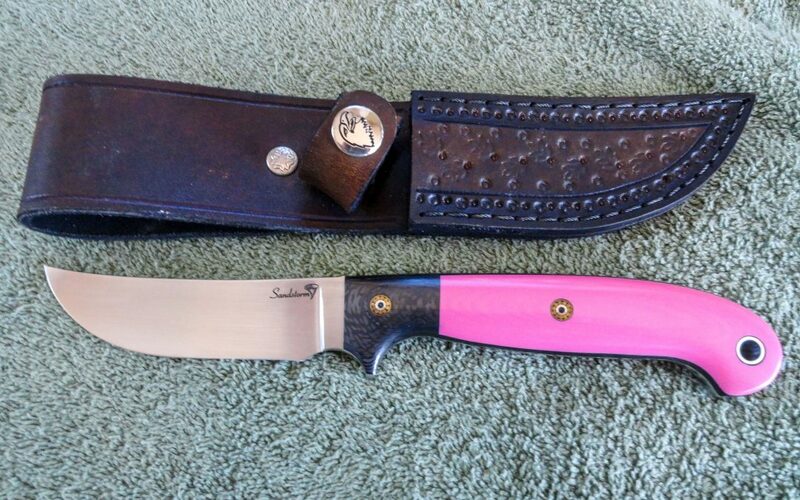 How cool is this Sandstorm custom pink hunting knife? Details: This one’s a 4″ Upswept Skinner with a Hot Pink G-10 handle with carbon fibre bolsters and handmade mosaic pins. The steel is S30V and tempered at 60 RC. The sheath has been hand dyed, hand stitched, and hand stamped. Check out some of the many other Sandstorm Custom Hunting Knives that we’ve made in the past for more style options. Don’t mess around with the quality of your hunting knife – invest in a Sandstorm knife and get a lifetime warranty plus free lifetime sharpening. Because life is too short to carry an ugly knife!